These pickups are competitively priced, sound wonderful and possess a cool vibe. What more do you want? No other choice for a noiseless '50s Fender tone. Shame the wiring diagram is so unclear. One of Fender's lesser-known secrets is its extensive list of accessories, and virtually anything that's fitted to an instrument owned by Fender is available as a retro-fit. We're sure there's a call for strap buttons and plate screws, but surely the most sought-after bits are genuine Fender pickups. In response, the company has released a veritable swathe of choices for its Strat, Tele, Jazz and Precision guitars. These sets of Samarium Cobalt Noiseless (SCN) Mod Shop pickups for Strat and Tele have been designed from the ground up by Bill Lawrence and whipped into shape by the Fender R&D department. "Rare Earth alloys, like samarium cobalt, are used to produce permanent magnets five times stronger than any other material," says Bill. Each package comes complete with a palpable '50s vibe and, bizarrely, a rather unclear wiring diagram. 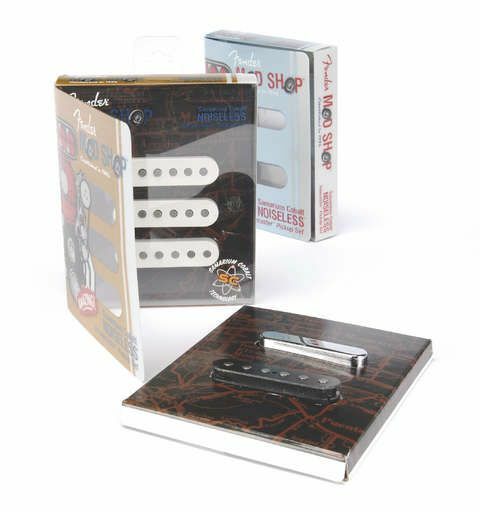 Each Strat pickup is available in white, black, aged white and parchment, while the Tele set is offered in black and chrome only. Needless to say, these pickups tick all the tonal boxes required by Strat and Tele players and their 100 per cent noiseless characteristics will attract many who find 50-cycle hum less than appealing.